We need repeal of an unconstitutional law that has filled our prisons with nonviolent cannabis users. The prohibition against marijuana was unconstitutional from﻿ its inception. I want to be able to grow my own food, medicine, clean energy/fuel, fiber without being bullied by corrupt authorities just to stay in line with the “collective” by growing a limited amount of plants! Why is anyone wanting to limit a plant safer than drinking water? There are plenty of examples to not let government regulate and control (screw up.) like tobacco for instance: by regulation the government poisons tobacco with cancer causing pesticides, then claim cigarettes cause cancer, Learn from﻿ the mistake. What right or authority does the Queen of Great Britain have in calling herself the Queen of Canada? What right does she have in being the plaintiff in charges made in the name of the Crown against any man or woman living on the landmass called Canada? The Canadian Governor General’s website has, and probably still does, point out that the office of Governor General is ‘de facto’, which in referring to government means that authority has been unlawfully usurped (assumed). It is interesting that the Criminal Code of Canada, (belonging to the de facto government of Canada), says in Section 15 that laws of a de facto government carry no liability for non-compliance. The BNA Act (1867) section 2: The provisions of this Act referring to Her majesty the Queen extends also the the heirs and successors of Her Majesty, Kings and Queens of the United Kingdom of Great britain and Ireland. The Imperial Parliament repealed section 2 of the BNA Act (1867) by the Statutes Revision Act of 1893. Under what authority did the successor to Queen Victoria, or successors to the British throne since, continue to rule Canada as the Crown of Canada? Where is the ‘CROWN OF CANADA’???? Where is the ‘THRONE OF CANADA’???? The Governor-General’s webpage told us that the office of Governor-General of Canada is ‘DE FACTO’, which, in political terms, means ‘WITHOUT AUTHORITY’. From where comes the ‘AUTHORITY’ of the corporate ‘PARLIAMENT’ or any Provincial ‘LEGISLATURE’ to make rules that must be obeyed by the free will adult men and women of Canada? That AUTHORITY cannot be found. The Canadian people never had opportunity to extend any of their individual unalienable rights to such a corporate body, any more than the Canadian people are subordinate to ‘Joe’s Trucking Company Inc.’ The whole system of Government in Canada is a TOTAL ‘FRAUD AND EXTORTION RACKET’ OF THE MOST VILE KIND while imposing involuntary servitude (slavery) upon us. The imposition is by ‘taxation’ – the harvesting of the wages of owned slaves. And that includes court fines for non-victim crimes – disobedience to legislated rules, and the use of such as the Motor Vehicle Act, and other legislated Acts/statutes to extract ‘tax-fines’ from us. Update: December 2010. It appears that the Monarch of Great Britain is acting as the agent for the corporate administrative body of the City of London, a city/state within England owned by the administrative corporation of the Vatican city/state – the Holy Roman Empire. British Monarchs were made vassals to the secular Holy Roman Empire in the King John treaty with the Pontiff of Rome in 1213 (FOREVER). Some apologists attempt to imply that the King Henry VIII church break-away ended that obligation. Others say it was the English revolution of the early 1600s, where King Charles I was behedded. However, the continued administration of England by an incorporated body politic, the English Crown, a sub-corporate body under the corporate Crown of the City of London, (deceptively called the ‘BRITISH CROWN) which, in turn is a sub-corporate body under the head fascist corporation of the World, the Holy Roman Empire, where the Pontiff (Pontifex Maximus), the CEO of that corporate body is declared to be ”RULER OF THE WORLD’. 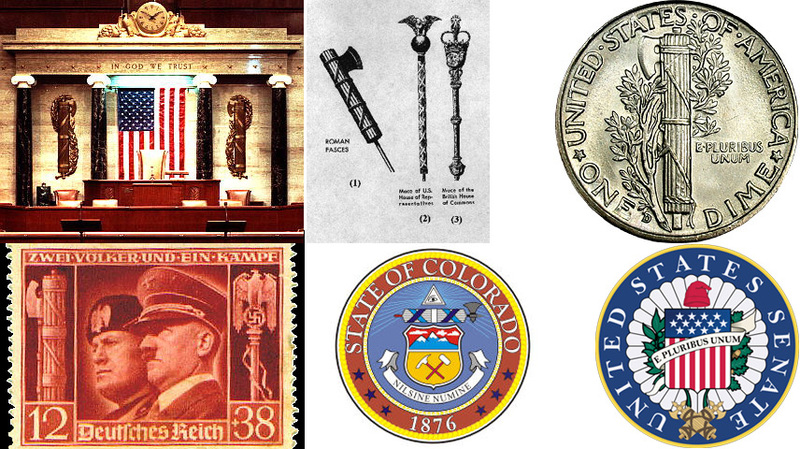 I use the term ‘fascist’ because the primary symbol of the Holy Roman Empire is the ‘fasces”fasces’, a symbol seen in all subordinate Government symbology in the Western World. And that RULE is performed using FORCE, FEAR, FALSE HOPE, BRIBERY, FIAT MONEY, and LOYAL BANKSTERS through such sub organizations of the Holy Roman Empire as the Rothschild Banking Empire, Jesuit Order, the Knights of Malta, OPUS DEI, the FREEMASONS, Professional Standards (University degrees), and the Roman controlled version of the KNIGHTS TEMPLAR, such as the Temple BAR. You will find that almost all elected politicians and key bureaucrats in Canada fall under one or more of these organizations. The Vatican “rules” over approximately 2 billion of the world’s 6.1 billion people. The colossal wealth of the Vatican includes enormous investments with the Rothschild’s in Britain, France, and the USA, and with giant oil and weapons corporations like Shell and General Electric. The Vatican solid gold bullion worth billions, is stored with the Rothschild controlled Bank of England and the US Federal Reserve Bank. The Catholic church is the biggest financial power, wealth accumulator, and property owner in existence. Possessing more material wealth than any bank, corporation, giant trust, or government anywhere on the globe. The Pope, who is the visible ruler of this colossal global wealth is one of the richest men on Earth. While two-thirds of the world earns less than two dollars a day, and one-fifth of the world is under fed or starving to death, the Vatican hordes the world’s wealth, profits from it on the stock market, and at the same time preached about giving. Like Vatican City, London’s Inner city is also a privately owned corporation, or city state, located right smack in the heart of Greater London. It became a sovereign state in 1694 when King William III of Orange privatized and turned the Bank of England over to the bankers. By 1812 Nathan Rothschild crashed the English stock market and scammed control of the Bank of England. Today the city state of London is the world’s financial power centre and the wealthiest square mile on the face of the Earth. It houses the Rothschild controlled Bank of England, Lloyd’s of London, the London Stock Exchange, all British Banks, the branch offices of 385 foreign banks, and 70 US banks. It has its own courts, its own laws, its own flag, and its own police force. It’s not part of Greater London, England, or the British Commonwealth, and pays no taxes. The city state of London houses Fleet Street’s newspaper and publishing monopolies. It is also the headquarters for worldwide English Freemasonry and headquarters for the worldwide money cartel know as the Crown. Contrary to popular belief the Crown is not the Royal Family or the British Monarch. The Crown is the private corporate city state of London. It has a council of twelve members who rule the corporation under a mayor called the Lord Mayor. The Lord Mayor and his twelve member council serve as prophecies or represent who sit in for thirteen of the world’s wealthiest, most powerful banking families. This ring of thirteen ruling families includes the Rothschild family, the Warburg family, the Oppenheimer family, and the Schiff family. These families and their descendants run the Crown Corporation of London. The Crown Corporation holds the title to worldwide Crown land in Crown colonies like Canada, Australia, and New Zealand. The British Parliament and the British Prime Minister serve as a public front for these ruling crown families. Like the city state of London and the Vatican, a third city state was officially created in 1982. That city state is called the District of Columbia and located on ten square miles of land in the heart of Washington. The District of Columbia flies its own flag, and has its own independent constitution. Although geographically separate, the city states of London, the Vatican, and the District of Columbia are one interlocking empire called Empire of the City. The flag of Washington’s District of Columbia has three red stars. One for each city state in the three city empire. This corporate empire of three city states controls the world economically through London’s inner city, militarily through the District of Columbia, and spiritually through the Vatican. The constitution for the District of Columbia operates under a tyrannical Roman law known as Lex Fori which bares no resemblance to the US Constitution. When Congress passed the Act of 1871 it created a separate corporate government for the District of Columbia. This treasonous act allowed the District of Columbia to operate as a corporation outside the original constitution of the United States and outside of the best interest of American citizens. A sobering study of the signed treaties and charters between Britain and the United States exposes a shocking truth that the United States has always been and still is a British Colony. King James I was famous, not for just changing the Bible into the King James version, but for signing the First Charter of Virginia in 1606. That charter granted America’s British forefathers a license to settle and colonize America. The charter also guarantees that future kings and queens of England would have sovereign authority over all the citizens and colonized land in America stolen from the Indians. Americas blood soaked war of independence against the British bankrupted America and turned its citizens into permanent debt slaves of the king. In the War of 1812 the British torched and burned to the ground the White House and all US government buildings and destroyed ratification records of the US Constitution. In 1604, a corporation called the Virginia Company was formed in anticipation of the imminent influx of white Europeans, mostly British at first, into the North American continent. Its main stockholder was King James I and the original charter for the company was completed by April 10th 1606. The Virginia Company owned most of the land of what we now call the USA. The Virginia Company (The British Crown and the bloodline families) had rights to 50%, yes 50%, of all gold and silver mined on its lands, plus percentages of other minerals and raw materials, and 5% of all profits from other ventures. The lands of the Virginia Company were granted to the colonies under a Deed of Trust (on lease) and therefore they could not claim ownership of the land. They could pass on the perpetual use of the land to their heirs or sell the perpetual use, but they could never own it. Ownership was retained by the British Crown. The original Organic American Constitution reads: “The Constitution for the united states of America”. The altered version reads: “THE CONSTITUTION OF THE UNITED STATES OF AMERICA”. When Americans agree to have a social security number the citizens of the united states surrender their sovereignty and agree to become franchises of the United States (The Virginia Company of the British Crown). The ‘Crown’ that owns Virginia (USA) is the administrative corporation of the City of London, an State independent of Great Britain and wholly owned by the Pontiff of Rome. Since 1213, the Monarchs of England have been puppet Monarchs under the Pontifex Maximus of the Holy Roman Empire, a corporate body over which the pontiff of Rome is CEO. Since 1300, when the Crown of Great Britain (England) was made a sub-corporation of the Crown of the City of London, the Monarchs of England, as CEO of the Crown of Great Britain have been agents for the Crown of the City. Thus, the real Crown was obfuscated from the eyes of the ‘colonials’. But, anyone who cared to look and reason could have seen this scheme even in the late AD 1700s. The ‘common law’ of England, since the incorporation of the British Crown around AD 1300, has been Roman Municipal Law, a type of Roman civil law designed to rule over debtor States. The Anglo-Saxon common law, which used only ‘God’s Law’, ceased to exist with the implementation of the feudal system where all people were subjects of the corporate Crown, and after the Pope’s Papal Bull, Unam Sanctam 1302 where he declared: “Furthermore, we declare, we proclaim, we define that it is absolutely necessary for salvation that every human creature be subject to the Roman Pontiff.” Subject means slave, as does ‘citizen’ and ‘freeman’. Roman Law uses the law of the sea because all human institutions in the Roman system are make-believe ships at sea (incorporated bodies). The ‘all caps’ spelling does not make the ‘legal identity name” (strawman). It is where the family name has been converted into a ’surname – primary name’. The all caps only signifies that the name carries with its use the status of slave pledged as chattel in bankruptcy of the State. This entry was posted in General Articles, Video and tagged activism, agenda, canada, cannabis, Chris Bennett, constitution, constitutional monarchy, death, depopulation, empire, fascism, Federal Court, freedom, hemp, Judge, law, laws, mafia, mafia cartels, marijuana, new world order, parliament, parliamentary democracy, religion, religious freedom, rights, spirituality, Stanley Cup, suppression, The Queen, violation of human rights, war on drugs by Myles O'Howe. Bookmark the permalink.